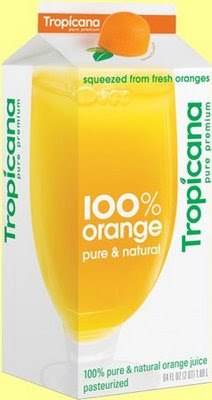 Tropicana's New Carton, New Look. Love or Hate it? "It's a new look, a new energy, but when it comes to the juice, it's just the way you like it." It's got a little 'orange' rounded cap. It's taken off the graphic of the orange with a straw stuck in it. The design colors and images are minimal. Tropicana's new carton, new look. Love it or hate it? Read more, for my review! I like it. But I did like that bright juicy orange with the straw stuck in it. But the health impact is not about the packaging. It's about the content! And though Tropicana is a very adequate orange juice product, I much prefer fresh, home squeezed orange juice. And hey, it only take a few minutes to get fresh, raw, unpasteurized, full of vitamins and enzymes....juice! Juicing 101 is my post on how to juice at home. Carton design won't change what is on the inside of the box.